Spellbind is coming to PC! Spellbind has already been downloaded more than 6K times since March and has received some quite useful feedback that made us realize the strong aspects of the game. Therefore I decided to start porting Spellbind to desktop machines. I wanted it to be a raw and quick port, without effort, so Unity seemed to be the only realistic option. Rapidly prototyping games using Unity, even 2D ones like Spellbind, is fun and so far everything is going smoothly. Sure, there will be some minor changes in inventory because we are in the the PC world now and we can afford full mouse support. But besides that, the game will be almost identical to the mobile version. Speaking about porting Spellbind, we also made some changes in our landing page which is proudly powered by the Strikingly service. Our choice of Strikingly for painlessly creating a landing page for the game that actually helped us to redirect users to the various download stores, proved to be very wise. With Strikingly, everything is achieved through a very intuitive editor that renders the development of the page into a pleasant procedure, especially to people like me, who dislike pretty much anything related to web development. In addition to that, there are various beautiful templates you can use to create something awesome and quick. If you need to instantly develop an incredible landing page for your product and you wish to skip many hours of frustration, Strikingly is strongly recommended! I said we are in the PC world now. So what’s left to do besides starting a Greenlight campaign on Steam? It is already active, so please vote for us if you feel so. In the last 3 months, Spellbind was downloaded more than 4k times. Some first insights about the game’s progress. As mentioned in a previous post, we finally decided to release Spellbind as a free application. Additionally, we used ingame advertisements in a rather small percentage of the total number of screens and for a limited game time, so we didn’t really expect to have any significant income. As expected, iOS proved to be a mature market having the majority of downloads with a valuable feedback about the game. A press release on PR Mac has been the main source of our iOS downloads. Some additional paid advertisements had a rather small effect on iOS downloads. On the other hand, Google Play didn’t go so well. Mainly because a black screen problem related to apk licensing procedure when the game starts for the first time only, we justifiably had some negative comments and rating. Furthermore, a few posts on Android applications related forums could not give a boost to Android downloads. Surely a major warning to avoid glitches like this in the future. However, what I didn’t expect was the activity in Amazon Store. A store with many adventure games players and with a very receptive audience as it proved to be. With virtually no marketing activity, but a few twitter posts, Spellbind had some impressive results. It received very good reviews and is listed as a top rated game. That was quite an encouraging feedback to us. Some other facts that should be taken into account. There were no reviews or notions about the game in any indie games channel. We used game analytic services for monitoring custom events. This helped us understand the actual difficulty of the puzzles. Various custom funnels and dashboards assisted us on monitoring the game flow. That way we are capable of knowing stuff like the number of people that have made it to the first part of the game and finally reached the last part or the number of puzzles which players found difficult to solve so they decided to skip them using the skip option. This kind of information is going to be very useful to our next game. – Release a game for mobile devices only. Not delivering a Spellbind PC version was clearly a mistake of us. That said, our next game’s primary platform will probably bethe PC platform. – Prepare a press release. – Use a game analytics service. – Try to reserve more money to spend on marketing activities. Viewing it from a developer’s perspective, we have learned a lot of new things by working on Spellbind, things we will use on our future efforts. We have raised some visibility and received valuable feedback that will help us improve. Perhaps this is the most important aspect of the entire procedure. We certainly intend to repeat it. This weekend actually feels strange because there is nothing left for us to test or work on Spellbind. Version 1.0 was approved by Apple and Amazon and is ready to be published on Google Play. Spellbind will hopefully be available on Monday, March 3. Initially, we intended to charge $1.99 but after some thought and discussion, we decided to go for a free release. We actually think that additional visibility is far more important than income. Rather, we added Google Admob banners (unobtrusive … I hope! :)) only in 10 out of 75 screens. Right now, an idea of a Spellbind remake as a first person 3d adventure exploration game targeting PC just came up. Well this is going to be quite a different game, so for now we will try to find some time to experiment with Unity 3D which will probably be our engine of choice. 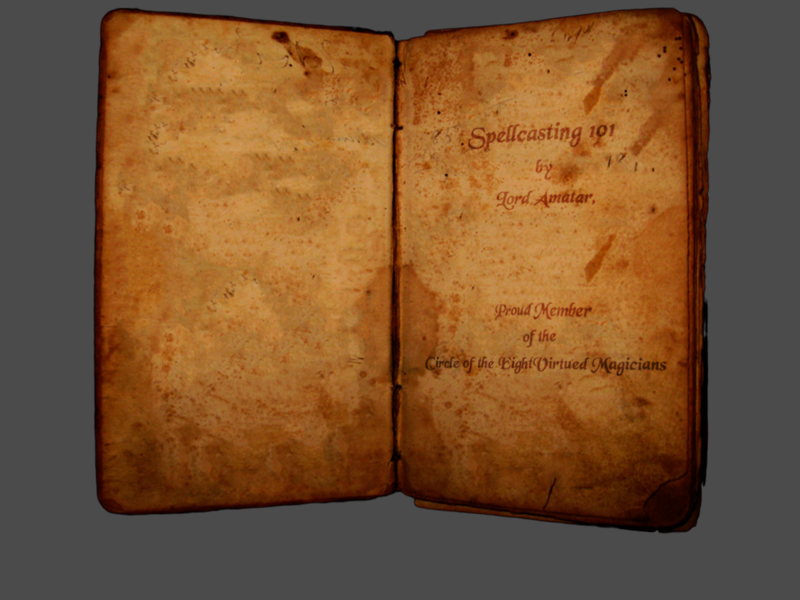 I hope we will soon be able to show some media from the “new Spellbind” playable prologue. Spellbind development is over and we are now running the final tests searching for hidden bugs. We intend to submit Spellbind on Apple store for review during this week. Marketing seems to be the most difficult part mainly because of our lack of experience and appropriate background. But it is a very interesting process and I believe we will be able to share our experiences combined with specific sales figures sometime in the near future. We already have started some promotion pre-launch activities including the submission of Spellbind to PreApps , an online Spellbind landing page and a new Spellbind video available on youtube. We hope you enjoy it. All comments and feedback are welcome! We had a lot of discussion regarding the price and the business model of Spellbind. Spellbind is an adventure game, so it seemed very difficult for us to design an inapp purchases model without affecting the flow of the game (actually we don’t know how to apply it to an adventure game), so we rejected the idea from the very beginning. Mobile ads is an alternative model but we don’t know exactly how it works and we certainly don’t want to experiment with a game we have spend 1.5 year in its development. On the other hand, we think that it is fair enough to charge $1.99 for more than two hours of gameplay. For an indie studio to be able to survive and ship new games, some sort of income (even low) is always necessary. Anyway, this is only our opinion and all our choices will be evaluated by the final outcome. 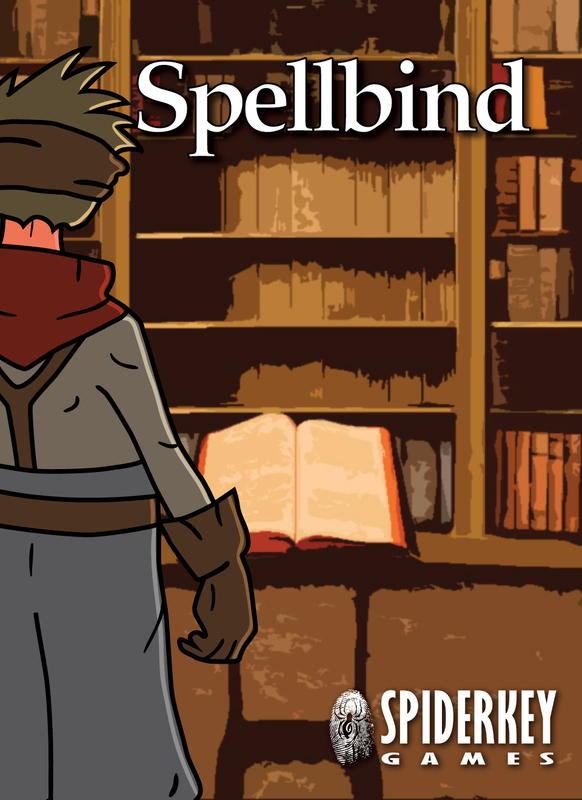 If you run a blog or are a game journalist and you are interested to preview, review or simply mention Spellbind, contact with us via Facebook or Twitter. Stay tuned, Spellbind launch is near .. Finally the latest book from Lord Amatar, a proud member of the Circle of the EightVirtued Magicians and an author well known for his simple and effective writing with thousands of dedicated readers, is about to be available in a couple of days in every major bookstore of our time. The title of the book? Spellcasting 101. Do you want to be a powerful wizard? Do you crave wizardry and wish to be like Lord Amatar, a formidable and widely respectable wizard? First things first. 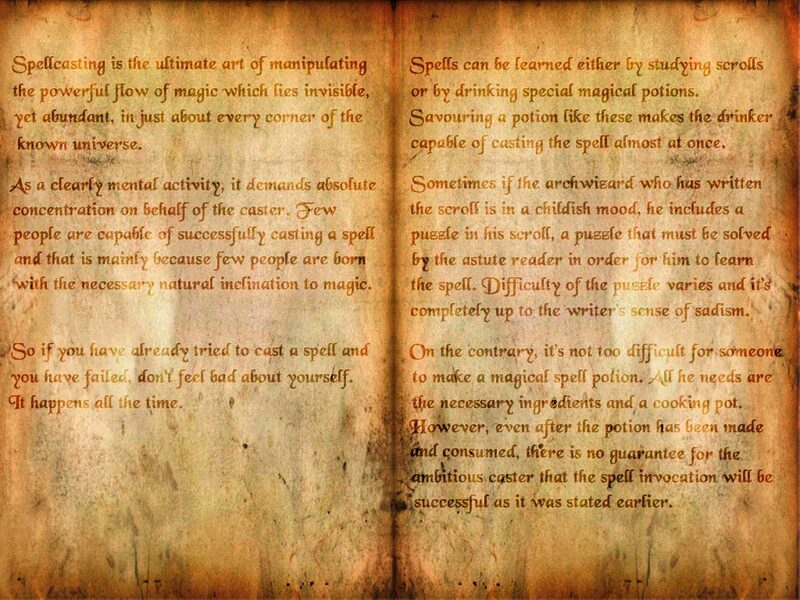 Start with the basics of the fine art of spellcasting, get a good grip on them and then you will be able to move on becoming the spellcaster you’ve been wishing to be all your life. This book is exactly what you need to begin. Only this book and nothing else. Just take a look and you won’t be disappointed. Spellcasting is the ultimate art of manipulating the powerful flow of magic which lies invisible, yet abundant, in just about every corner of the known universe. As a clearly mental activity, it requires absolute concentration on behalf of the caster. Few people are capable of successfully casting a spell and that is mainly because few people are born with the necessary natural inclination to magic. So if you have already tried to cast a spell and you have failed, don’t feel bad about yourself. It happens all the time. And some photos of one of the first, already invaluable, prints of the book. Clearly a book you cannot afford to miss!